The Runaways and the Young Avengers were given a mini-series to explore their part in the Secret Invasion. 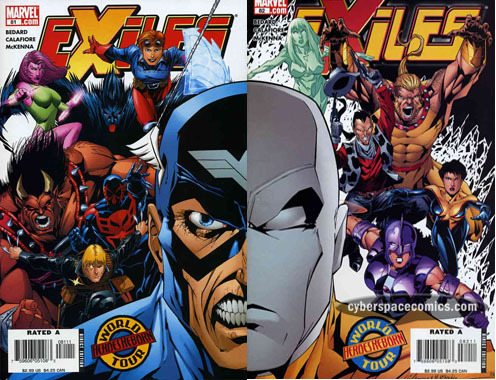 All three covers by Michael Ryan combine to make one image. 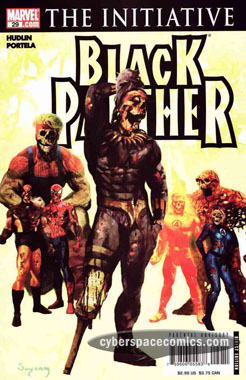 Avengers #87 revealed the origin of the Black Panther and, years later it’s cover was paid homage by Arthur Suydam’s “zombiefied” cover to Black Panther vol. IV #29. Cyclops‘ latest sulkfest is interrupted by the path of destruction caused by Batroc the Leaper and the Circus of Crime as they race back to report to their new, mysterious leader. 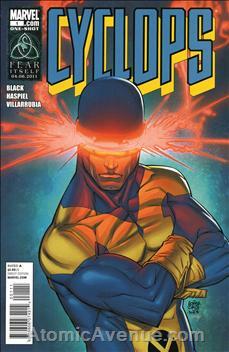 Cyclops hops on to a stolen (ok … borrowed) bicycle and tracks down the villains. He quickly dispatches them with his optic blast but can he defeat their boss (spoiler: It’s Baron Zemo XII) without the aid of his fellow X-Men? If you’re missing the classic version of Cyclops (less cocky and more inexperienced … but still very straight-laced) or you’re just jonesing for some classic “silver-age” style fun, then this is the book for you. Black and Haspiel evoke the early days of Marvel but they execute it with modern storytelling – the best of both worlds! And hey! How about that Roger Cruz cover? 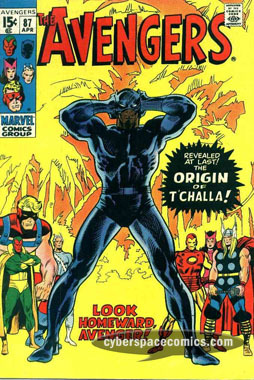 Black Panther narrowly escapes being drowned by Elmer Gore and manages to turn the fight around, defeating the mercenary. Finally, he can make his way, unfettered, into the mansion of Anton Pretorius (South African Magistrate of Communications) who is holding the Panther’s long-lost mother, Ramonda. He breaks in through a window to find his mother chained to a bedpost, the object of affection for Pretorius. The secret object, that is. For, surely, interracial love was forbidden in South Africa, at the time. Especially amongst high-ranking officials! Ramonda reveals that the letter she wrote was meant to protect him and that it did not reveal her true feelings. Like any real mother, she longed to be reunited with her son. And, now, with Anton easily defeated, they are! Balthazar and a horde of other demons have lured Devil-Slayer into a trap, surrounding him within a night club. As their plot is exposed, he reaches into his shadow cloak and draws … Dragonfang! It’s Valkyrie’s sword – but for him to possess the sword, it must mean that she has died! He puts the thought aside, but, as the battle against a horde of demons continues, he finds his cloak is being controlled by an outside force. It transports him and the horde to the Border of the Land of the Dead where he encounters statues of Valkyrie, the Interloper, Manslaughter and Andromeda (their remains were left behind in New Defenders #152 – the final issue). After dispatching Balthazar and the other demons, Devil-Slayer determines that Dragonfang has transported him to this land to be reunited with its master’s remains. With this issue, the longest story in MCP history draws to its end. 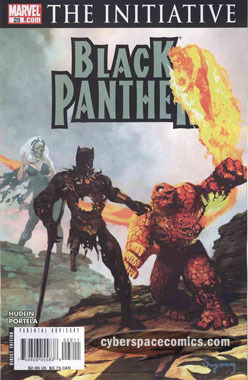 Although, it really only signifies the beginning … the start of the healing process for the Black Panther’s relationship with his mother. At times, this story really seemed to drag on (to be fair, it is 216 pages in total). It expanded scenes that could have been handled in one page, into an 8-page tale. To be fair, it gave McGregor a chance to delve deep into the Panther’s mental-processes and revealed the thought or instincts behind his every move. Aside from being an important part of the Panther’s history, it also served to make the reader aware of how things were in South Africa. It was given the opportunity and allowed plenty of room in the story to show the plight of the black man, worked to death – and the white mercenaries ruling over them. This story was truly a shared feature – the unjust culture of South Africa was exposed and shared the spotlight equally with the Black Panther’s quest to find his mother. As a continuity-junkie, I was excited to see that the Devil-Slayer story tied in well with the events of the last issue of the Defenders (or, New Defenders, as it was called, then). And, as a Marvel Zombie, I’m a bit ashamed to admit that I didn’t guess the identity of the Loonies’ boss (from the Excalibur feature) until Kitty Pryde called their prisons Murderworld. Tony Isabella is a writer that had his hands on lots of titles from Marvel’s bronze age: Ghost Rider, the Champions, Power Man, Iron Man and Captain America. Here, he pokes fun at Marvel’s past storylines involving identity-swapping. 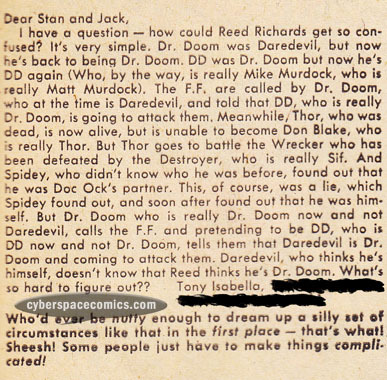 This letter was published in Fantastic Four #77 (cover date – August 1968). The Exiles’ World Tour storyline finished up in the Heroes Reborn universe. The final two covers can be put side by side – although, I think (story-wise) they’re meant to be put face to face! 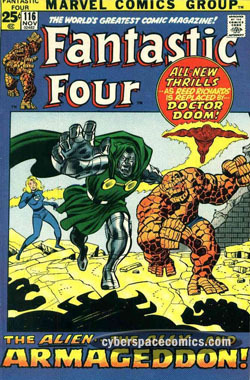 Fantastic Four #116 was a super-sized issue that saw Doctor Doom aligned with the Fantastic Four. Decades later it was fodder for another Suydam Marvel Zombies homage. Spider-Ham goes on a trippy quest to locate his lost thought balloons. On his adventure, he gets caught in the middle of Marvel’s Civil War and then transported into space by Doctor Strange. 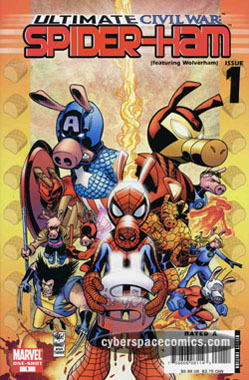 Afterwards, he’s dropped into the Vietnam War which leads him to a portal that reveals some parallel heroes form his anthropomorphic version of the Marvel Universe including Wolverham, Iron Ham, and more. Doctor Strange scoops him back up and drops him off back to where the story started. And, finally, Spider-Ham finds thought balloons – he steals them from Spider-Rat! No … seriously! This story was nearly 100% unenjoyable and almost totally incoherent. Its only redeeming quality was when it poked fun at Marvel’s newer policy of never using thought bubbles (and using narrative boxes, instead). There were quite a few pin-ups that were fun to look at by great artists including Skottie Young, Clayton Crain and Ariel Olivetti but not good enough to make up for the lousy story. Phoenix finds herself locked in a world of nothing but fire and flames. And, after a vision of the future-version of Kitty Pryde, she then finds herself in complete darkness. Outside the prisons, Kitty Pryde has reprogrammed one of the Loonies (Sylvester) to free her friend, Phoenix. By the end, nearly all of Excalibur has been freed – all but Captain Britain! With his ankle caught in a trap, the Black Panther is easy prey for Pretorius’ advancing attack dog. The Panther frees himself just as the doberman jumps him. But, the animal is no match for the Warrior King of Wakanda. Advancing on the mansion where his mother is being held, the Panther must now fight his way through Gore, the mercenary. Hellcat stumbles upon some thugs threatening a woman but, she isn’t able to prevent them from shooting her and running away. As she tends to the woman in her dying moments, Hellcat discovers that she was an undercover cop. She uses the cop’s received to lead her back to a pharmaceutical company where Dr. Bartley is developing profitable varieties of street drugs. With her athletic prowess, Hellcat is able to avenge the cop’s death and shut down the drug lab. 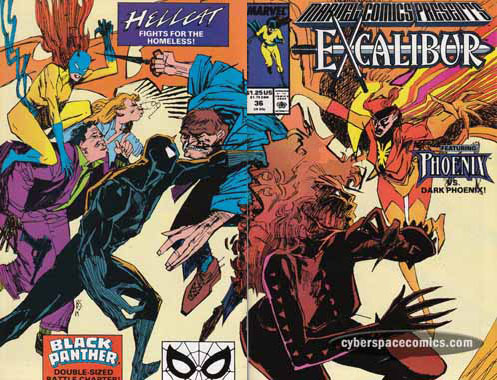 The Excalibur and Hellcat features were very bland, this issue I was quite disappointed by the Bill Sienkiewicz cover (and it’s not because I’m not a fan of his work, either). Black Panther’s feature was double-length this time and chock full of action! Don McGregor has written a lot of comics. He’s also written a lot of good comics (an important distinction). Two of his most well-regarded runs were the Killraven features from Amazing Adventures (loosely based on H.G. 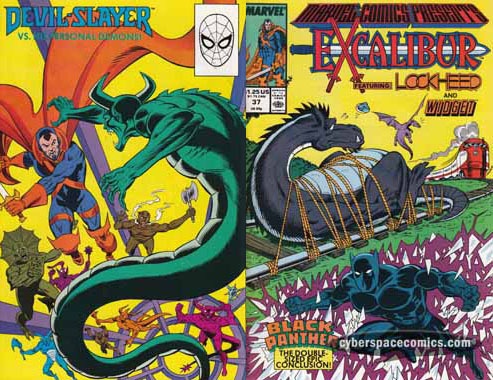 Wells’ the War of the Worlds) and the Black Panther: Panther’s Rage storyline from Jungle Action. His graphic novel, Sabre: Slow Fade of an Endangered Species was actually published months before Will Eisner’s A Contract With God (which is widely considered “the first graphic novel”) and went on to later become an ongoing series. McGregor also went on to write non-super-hero comics, which was a bold move, at the time. He got a letter published in Fantastic Four #74 (cover date – May 1968).